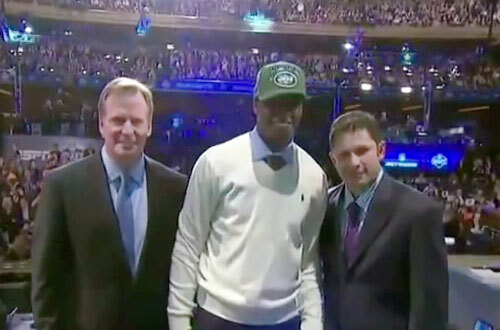 Wayne Chrebet, a retired wide receiver for the New York Jets and one of the most popular Jets players in recent memory, announced quarterback Geno Smith as the Jets’ 2nd round pick in this past weekend’s NFL draft. Chrebet, an undrafted free agent out of Hofstra, played for the Jets from 1995-2005 and finished his career as one of the top receivers in franchise history, ranking 2nd all-time with 580 career receptions and 5th with 7,365 yards from scrimmage. He also had the third-most receptions in NFL history among players who were not drafted. His jersey number hasn’t yet been retired but the Jets haven’t issued his number again since his retirement. Each NFL team had one of its all-time greats announce one of the team’s draft selections. Among the other retired players participating including Deion Sanders (Atlanta), Merril Hoge (Pittsburgh), Warren Sapp (Tampa Bay) and Steve Gleason (New Orleans). Gleason’s participation provided the most poignant moment of the entire draft because he’s suffering from ALS. Wayne Chrebet is also a dynamic motivational speaker and is one of our more popular athlete speakers says Sports Speakers 360. If you would like to book football speakers or NFL stars like Wayne Chrebet for a speaking engagement, autograph signing, VIP meet and greet, charity fundraiser, Super Bowl party or special event, you can request Wayne Chrebet speaker & Wayne Chrebet agent info or call 855.303.5450.